Finally, after struggling a lot with the maze generation algorithm for my Creative Coding module at Goldsmiths, I managed to implement it and have it working properly. I redesigned it completely because there were different errors in the previous version and it was faster to start it again from scratch then check the code over and over again. So, after 1600 lines of code, the cubeMaze generator is ready to be used to create the final labyrinth mesh for our iPhone game! Here is a snapshot from one of my teammates work, which shows the mesh generator ready to get my data! For my first assignment of the Workshop in Creative Coding at Goldsmiths we have to utilize OpenFrameworks to create an iOS mobile application. It is a group project, and one of my team mates came up with an idea base on my maze generator that I implemented for my Intro to Game Programming Assignment. 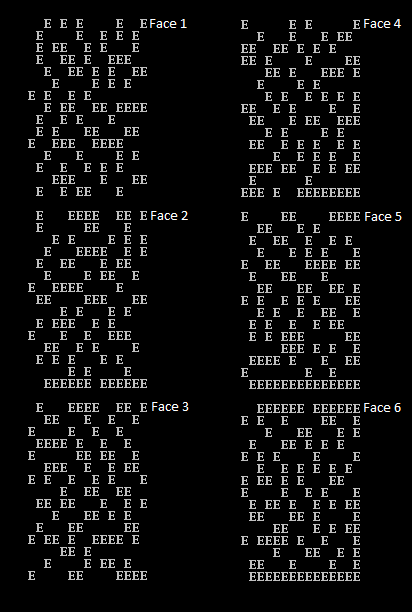 The idea is basically to riproduce my maze generation algorithm on the surface of a cube. So in these two days I went crazy trying to provide the right algorithm that will be used to produce the final labyrinth mesh. After struggling for ages because of the thousands more controls that I need to do, I finally managed to get something acceptable. Here are my results coming just from the console. Every face is printed one by one, the E character represent the wall, and where there is nothing it means that there is… nothing! The player will be able to move between the empty space… I hope.